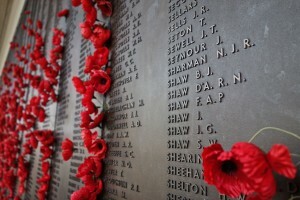 I’ve heard the line ‘They shall grow not old…’ every year of my life, yet it still catches me out. Wars need poets. When I look at the photo above from my father’s World War Two album, taken during his time in North Africa in 1941/42, I wonder whether these soldiers fell or grew old. Unfortunately the photo is uncaptioned and I have no names for them. They seem to be posing, demonstrating a lesson in warfare. 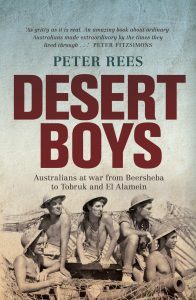 I’m struck by its similarity to the image on the cover of Desert Boys by Peter Rees, a book about Australian soldiers who fought in the desert in both world wars. 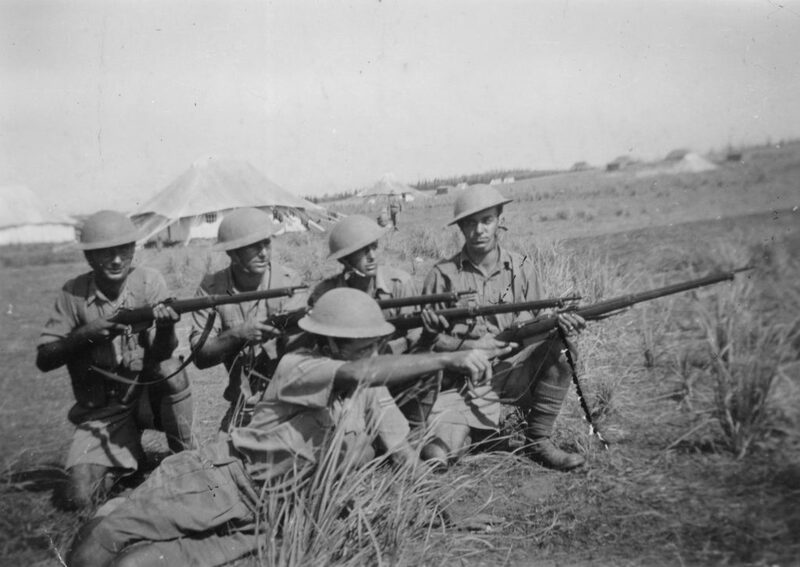 In each photo there are five young Australian men in helmets, focusing on something to their left. Perhaps these cover men are also posing. In any case, their photos remind us that they went to the desert to fight, and may not have returned to grow old. 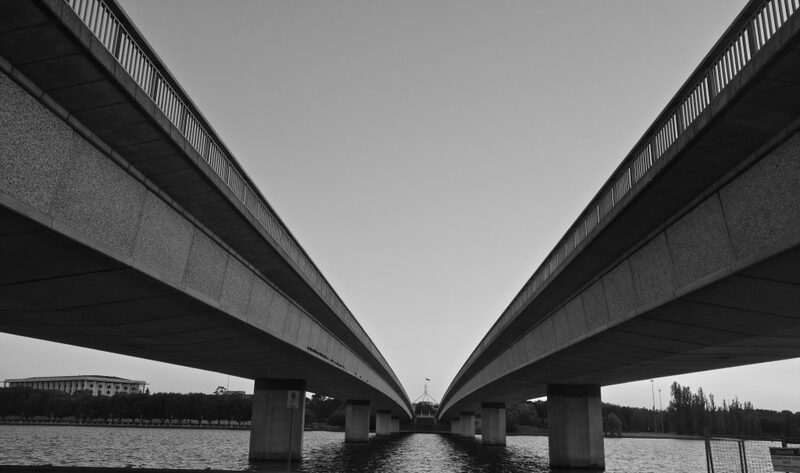 On an exceptionally hot evening early in January a middle-aged couple came out of the house in which they lodged in H. Street and walked slowly, as though in hesitation, towards C. bridge. Yesterday evening and this evening are the endings of exceptionally hot days in Canberra. Today, 39 degrees. The number of words is similar to Garnett’s, but what it loses (for me) is the immediacy in her first words, “On an exceptionally hot evening…”. The other two translators tell us first off what month it is, but that’s not as good a beginning for a great opening line. Perhaps I’m presently susceptible to Garnett’s first words since it’s about 10 pm and the temperature in my house is still 30 degrees. 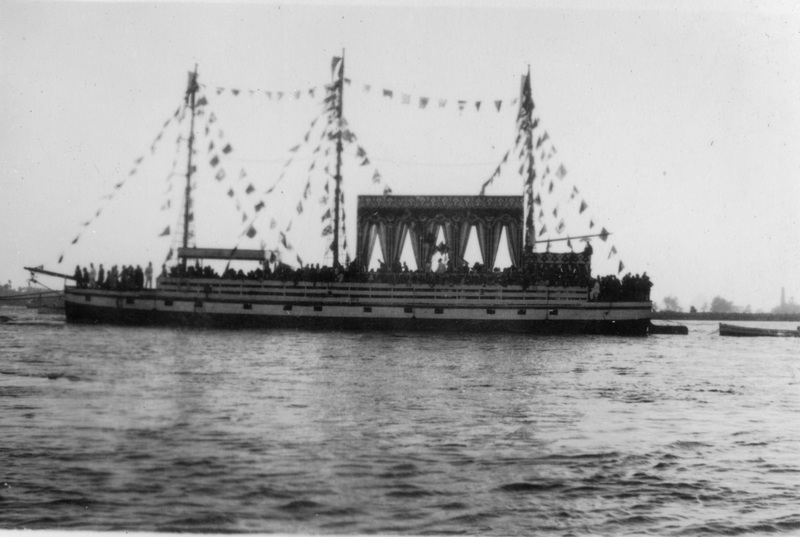 A reader of this blog, a maritime archaeologist writing a PhD, expressed an interest in some of the photos I’ve posted here over the past five years, especially images of the Nile and its boats. So this post is about the Nile River, Egypt, in a particular period, 1941/42. 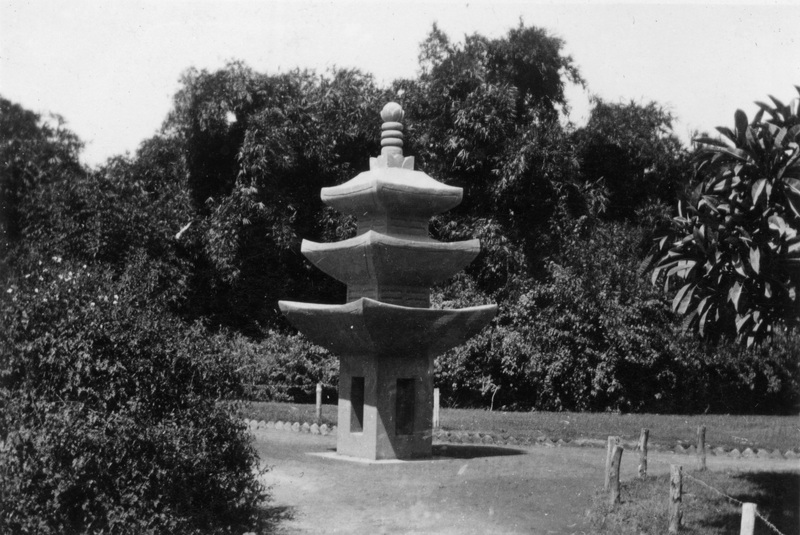 The photos are from my father’s album, from a time he was stationed there for seven months with the army (not counting the couple of months to get there and back). He took photos and swapped photos with his mates, stuck them in an album and left them for his family to do what they wanted with them. Many of these photos have been on this blog before, with a couple of exceptions. Where there were captions beneath the photos in the album, I’ll repeat them. Where there was none, I’ll write what I know, if I know anything. The photographers of these photos are unknown. Some were taken by my father, some were not. I don’t know which is which. I love all my black and white 1940s photos, but I totally love the feluccas and never tire of looking photos of them. Thanks, my reader, for asking me to take another glimpse into 1940s Nile history. My father captioned this photo in 1942 ‘Dud bombs’. But judging by the rubble almost covering the small building at the bottom right, some earlier bombs had done the job they were made for. The WordPress Weekly Photo Challenge this week is to find an image that evokes danger, so I immediately thought of this one from Dad’s war album of photos from Egypt and Libya. I don’t have a clue about bombs, exploded or unexploded. But these dud bombs were probably a source of danger. 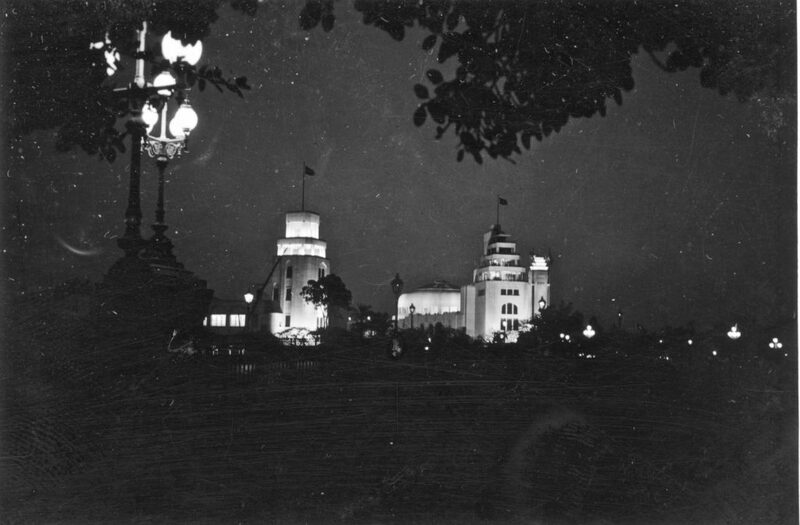 Two photos from the old war album. The captions are as I found them, written by my father. The photographer is unknown: they might be my father’s photos, or they might have been given to him by a mate. Thanks WordPress for prompting me to post photos of framed shots. This week’s photo prompt, Curve, immediately made me think of the semicircular arches on the Catholic Basilica in Heliopolis, Cairo, or Basilica of the Virgin Mary. I’ve written about it and posted a few photos in other posts, for example here and here and here, but I have a fourth one from a different angle. It’s a church that’s not particularly Roman Catholic in a western European sense, but rather more like the Byzantine basilica, Hagia Sophia, in Istanbul, which also has large semicircular arches on its sides, and multiple domes. 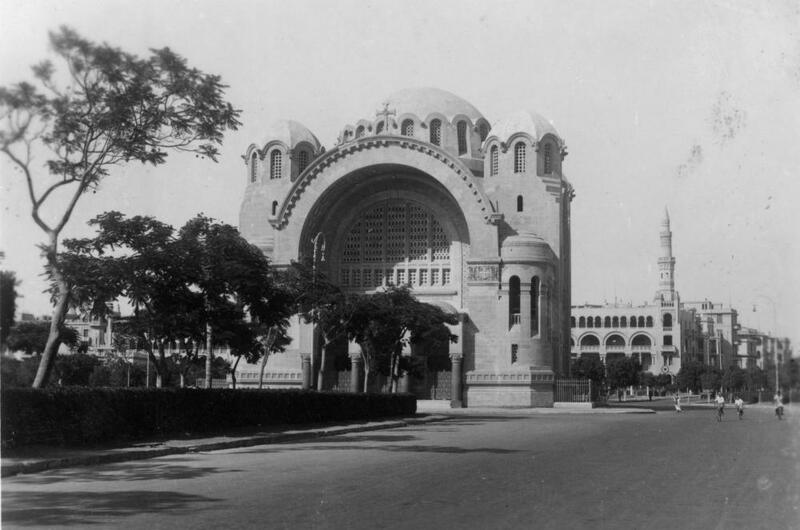 The Heliopolis basilica is deceptively cake-like in this photo and doesn’t look too monumental, that is, until you look at the little man walking down the road! I post these images for those who are interested in not-so-ancient Egyptian history; they are from my father’s war album, a collection of photos he took in 1941/42 as well as photos from his mates. Each time I’ve looked at this photo of Lieutenant-General Thomas Blamey handing out Aquatic Sports Trophies to members of the AIF, I’ve thought I should blog about it. 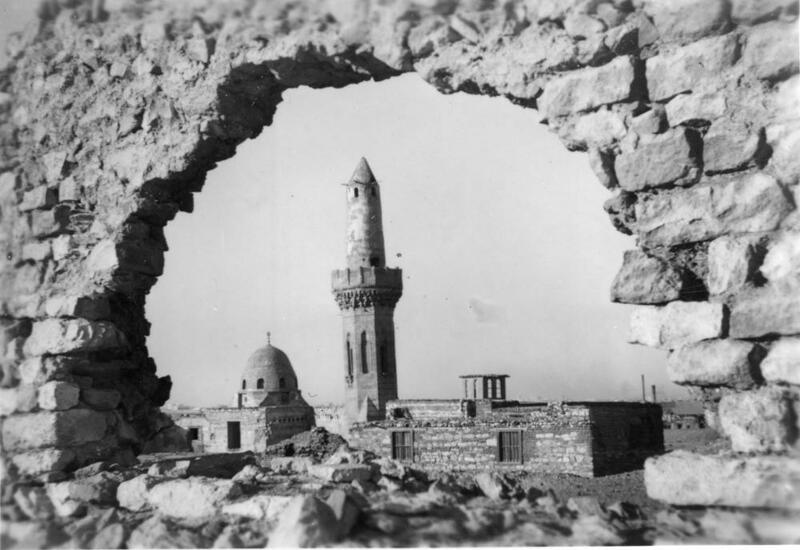 The photo is one of many in my father’s collection that he brought back from the Middle East in 1942, though this one was not taken by him. Similar images of this trophy ceremony in Kantara, on the eastern side of the Suez Canal in Egypt, are available on the the Australian War Memorial site, which suggest that the photo was taken on the same day, 30th August 1941. This week’s WordPress photo challenge, ‘Gathering’, gives me a reason to send it out into the world. I like looking at the individuals in the gathering who are watching Lieutenant-General Blamey giving his speech and congratulating the winners. They’re clapping, smoking and taking photos, but in particular they’re laughing. He must have cracked a good joke! Later he became Field Marshal Sir Thomas Blamey, and here in Canberra he has a square named after him, the Field Marshal Sir Thomas Blamey Square. A mouthful. Thanks WordPress for the Gathering photo prompt! Where land meets water in a large city, we build homes and offices for the short walk to the beach and the long view of the open sea. It’s a place to turn our backs on all that disturbs us in society. 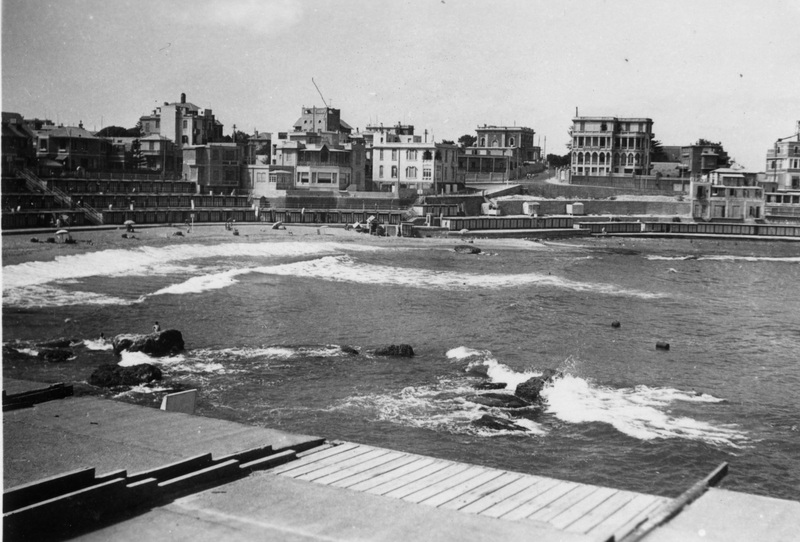 For Ailsa’s Land Meets Water photo challenge, here’s a photo of Stanley Bay, Alexandria, Egypt in about 1941. The corniche, the road running round the coastline, was constructed in 1935. The descending levels of concrete bathing cabins added on the shoreline form an amphitheatre that looks onto the Mediterranean. Here in 1941 people are bathing in the sun and sea, and, by all appearances, are unafraid. Yet in May, June and December of that year there had been fierce enemy air and sea attacks on Alexandria with hundreds of people killed and injured. In this scene there are bathers on the sand, in the water and on the rocks, as though all is well. Today Alexandria is not facing the same threats, but the population has multiplied. Modern photos show the corniche lined with high-rise apartment blocks, not as picturesque as those in the 1940s, and with not nearly as much space to roam between buildings. And town planners seem to have had second thoughts about the bathing boxes, which have disappeared. 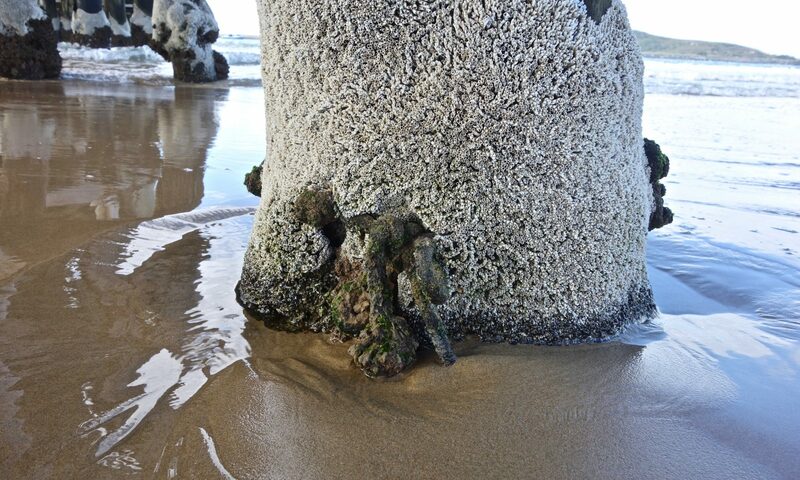 Only the sea remains the same. The photo is from my father’s WWII album. 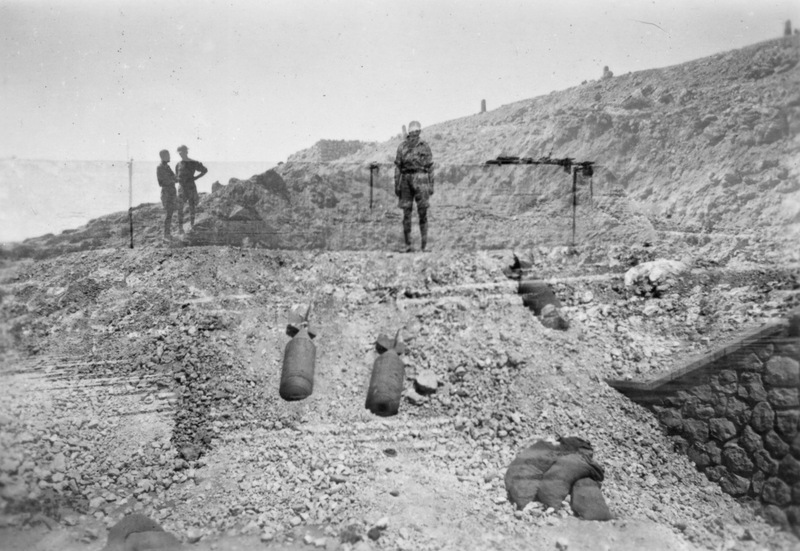 On 25th April it will be 100 years since Australian and New Zealand soldiers charged the beaches in Gallipoli, Turkey, in an attempt to beat the Turks and give the Allies a chance to take Constantinople. They were mown down, slaughtered. The battles continued for months until December 1915 when they withdrew, defeated. 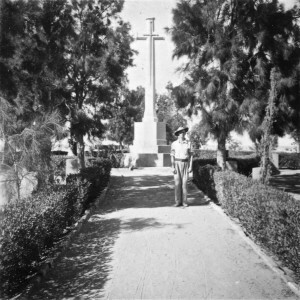 Out of a population of less than 5 million, Australia lost 8,000 young males at Gallipoli. The following year, 1916, my grandfather, Ernest Bruce, joined the army after stowing away on a ship of volunteers headed for Egypt. In July at Pozières, France, on the Western Front, he was trapped under concrete in an explosion, and then gassed. But he survived. He was one of the 40,000 Australians killed or wounded in 1916 on the Western Front (see AWM). That’s a huge part of a population of 5 million. When he returned to Australia, he was too ill to work for more than a few days a week, yet it took the government years to offer him a pension. His oldest son was my father, Ronald Bruce, who hadn’t learnt a thing about the futility of volunteering to fight in a war. 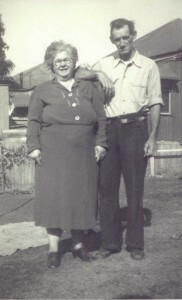 In 1941 he joined the army, was sent to Egypt, and months later was sent home with shell shock. He couldn’t hold down a job, and at 25 was offered a pension. 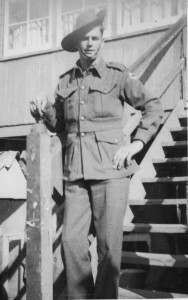 This Anzac Day, I honour my father and grandfather for volunteering to participate in Australia’s defence. 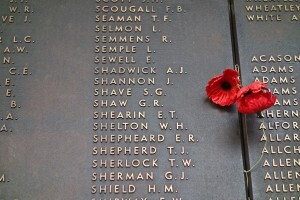 At the Australian War Memorial in Canberra there is a wall called the Roll of Honour. 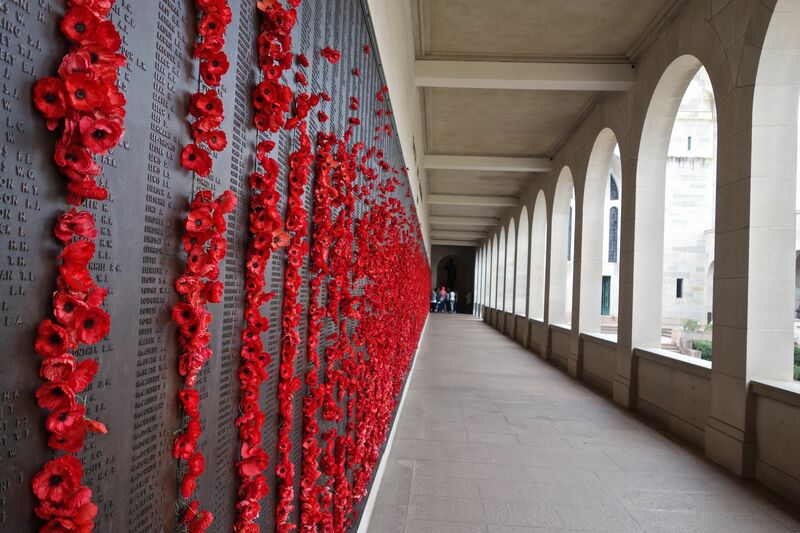 It’s covered in the names of Australians who have died in war. My grandfather and father are not on the wall because they returned alive; but my grandfather’s three cousins, the Shaw brothers, and my grandmother’s two cousins, the Burley brothers, did not. They are all buried on the Somme in France, and their names are here on the wall. I put poppies beside their names. Since I learnt that they were all killed while my grandfather returned, I haven’t looked at life the same way.